백근영, 서영석,(2011).여성 직장인의 성적 대상화 경험과 일몰입의 관계.한국심리학회지: 여성,16(4),555-571. 본 연구에서는 대인관계에서의 성적 대상화 경험이 외모에 대한 사회문화적 태도의 내면화와 신체감시를 매개로 직장 여성의 일몰입에 영향을 미치는지를 검증하였다. 연구를 위해 서울과 경기 지역에 근무하는 직장 여성 252명으로부터 자료를 수집하였다. 구조방정식모형을 통한 자료 분석 결과, 우선 측정모형이 자료에 적합한 것으로 나타났다. 모형 검증 결과, 성적 대상화 경험에서 신체감시, 내면화에서 일몰입으로 가는 직접 경로를 포함하지 않은 가설모형이 더 적합한 것으로 나타났다. 가설모형에서는 신체감시에 대한 성적 대상화 경험의 영향을 내면화가 완전매개하고, 일몰입에 대한 내면화의 영향을 신체감시가 완전매개하는 것으로 나타났다. 마지막으로, 대인관계에서의 성적 대상화 경험은 내면화와 신체감시를 매개로 일몰입에 부적인 영향을 미치는 것으로 나타났다. 연구결과를 바탕으로 후속 연구 및 상담실제에 대한 시사점을 논하였다. 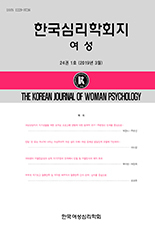 On the basis of the objectification theory and extant literature, the present study examined whether interpersonal sexual objectification experiences influence female workers` flow experience by way of internalization of standards of beauty and body surveillance. Participants were 252 Korean female workers at eight regional companies in South Korea. Overall, the present findings indicate that female workers who experience more sexual objectification in interpersonal situations are more likely to internalize the sociocultural standards of ideal appearance and monitor their body, which leads to impede their flow experience at work. Given that the link between interpersonal sexual objectification and work-flow was fully mediated by internalization and body surveillance, educational and counseling interventions should be focused on the two mediators. Implications and suggestions for practice and future research are discussed.